Hydrolases are among the most searched microbial molecules in soils; they compose a class of enzymes that catalyze the hydrolysis of covalent bonds, and have large industrial uses.17 Micro-organisms use hydrolases for degradation of natural organic polymers as source of energy; in addition, they are also involved in the metabolism of xenobiotics such as pesticides. New hydrolases with biotechnological potential, for example, lipases, amylases, proteases and cellulases, have been isolated by using different metagenomic strategies18,19; screening of enzymes in metagenomes is usually performed in silico, based on comparisons of gene sequences in databases. The aim of this study was to identify hydrolases with potential industrial applications in an agricultural soil under different soil and crop managements in southern Brazil, through an in silico screening of shotgun DNA sequences obtained in four metagenomes. DNA extraction, shotgun sequencing and data processing have been described before.5,8 Shotgun sequencing resulted in about 1 million sequences for each treatment,5 and the datasets are deposited in the NCBI-SRA (National Center for Biotechnology Information- Sequence Read Archive) with the submission Accession Number SRA050780. The four soil metagenomes, totaling 4,079,223 sequences, were compared against sequences of hydrolases deposited at the NCBI-NR and KEGG (Kyoto Encyclopedia of Genes and Genomes) databases, and assigned according to the highest similarities. First, sets of data were created with the DNA sequences for each hydrolase (amylase, cellulase, laccase, lipase, pectinase and protease) from microorganisms (bacteria, archaea, fungi and virus) extracted from the NCBI database. 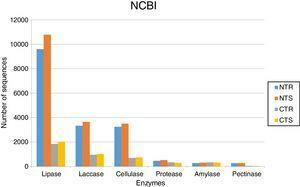 The DNA sequences of each hydrolase were then compared with the sequences of the four soil metagenomes, by using the BlastX tool against the NCBI-NR and the KEGG databases. The datasets were normalized by using the MG-RAST tools, as described before5; and analyzed with STAMP20 to identify differences in frequencies of DNA sequences coding for enzymes in the metagenomes, by comparing all combinations of treatments pairwise. Statistical significance was estimated with the G-test (w/Yates’) and Fisher's test at p≤0.05, using the Bonferroni's correction method, and DP:Asymptotic-CC for estimating the confidence interval. The soil management strongly affected the occurrence of lipases. Based on KEGG database, we identified 9392 sequences in the NTR (no-tillage with crop rotation), 10,582 in the NTS (no-tillage with crop succession), 1452 in the CTR (conventional tillage with crop rotation), and 1612 in the CTS (conventional tillage with crop succession) systems (Fig. 1). Based on NCBI-NR database, we found 9606 sequences in the NTR, 10,802 in the NTS, 1839 in the CTR, and 2035 in the CTS systems (Fig. 2). Abundance of DNA sequences coding for hydrolases identified with the BlastX tool showing homology with sequences deposited at KEGG database for each of the four metagenomes obtained from an oxisol in southern Brazil under 13-years of no-tillage (NT) or conventional tillage (CT), with crop rotation (R) or crop succession (S). Abundance of DNA sequences coding for hydrolases identified with the BlastX tool showing homology with sequences deposited at NCBI-NR database for each of the four metagenomes obtained from an oxisol in southern Brazil under 13-years of no-tillage (NT) or conventional tillage (CT), with crop rotation (R) or succession (S). Number of DNA sequences related to the main microorganisms identified in each hydrolase class in the four metagenomes obtained in this study. The statistically significant results for the pairwise comparison using STAMP are shown in Fig. 4. Differences on the occurrence of sequences coding for lipases were confirmed and mainly attributed to the tillage systems (p<0.05). On average, there were 550% more lipases in the NT than in the CT system; the CR presented 12% less sequences than the CS, but these differences were not statistically significant. Statistically significant differences for the frequencies of DNA sequences coding for hydrolases, evaluated with the STAMP software in the comparison between no-tillage (NT) and conventional tillage (CT) soil managements, under crop succession (S) or crop rotation (R) in a 13-year-old field experiment performed in an oxisol in southern Brazil. Only the hydrolases with statistical differences (p<0.05) are shown. Lipids from oil seeds, such as soybeans, may stimulate the high abundance of lipases in agricultural soils. Both CT and NT soils have been cropped with soybean, but the main effect was attributed to the NT, which maintained the crop residues on the soil surface. Therefore, the NT favors not only the accumulation of organic matter, water retention, more favorable soil temperature conditions and microbial biomass,4,5,10–12 but also microbial diversity,4,5 and the higher abundance of lipases that we now report might contribute to the decomposition of the crop residues. In addition, lipases and organic matter may be related; indeed, Beyer et al.26 reported greater survival of Verticillium with higher organic matter content. The higher abundance of lipases under the NT is also important for the biogeochemical cycles, as lipids are sources of energy for soil microorganisms; they may also assist in environmental bioremediations (digesters, oil degradation, xenobiotics).27 Lipases are broadly used in industries, in processes such as the synthesis of biosurfactants, cosmetics, agrochemicals, food, detergents, paper, and oil processing.27,28 Due to their high economic value, the search for new lipases has grown fast, especially with studies of metagenomics; for example, Lee et al.29 analyzed 33,700 clones from a Korean forest soil and found novel lipase activities in six clones. Laccases were the second most abundant hydrolases in the four metagenomes of our study. Based on the KEGG database we found 8557 sequences, 3300 in the NTR, 3609 in the NTS, 807 in the CTR, and 841 in the CTS systems (Fig. 1). Similar numbers were found based on the comparison with the NCBI-NR database, with 8964 sequences, 3332 in the NTR, 3656 in the NTS, 960 in the CTR, and 1016 in the CTS systems (Fig. 2). The statistically more frequent occurrence of laccases in the NT system was confirmed (Fig. 3). The sequences were mostly assigned to the genus Colletotrichum (8724 sequences) (Fig. 3), which is known as a natural producer of laccases, property that has often been related to pathogenicity.30,31 Moreover, laccases are also very important for bioremediation, due to their ability to oxidize an array of compounds, such as pesticides, as well as lignin.32 However, one must consider that that the fungal data bases are limited in laccase sequences that have been annotated, and that other genera can be important for their production. The biotechnological potential of laccases has led to their bioprospection in metagenomes in several environments. For example, Fang et al.33 reported a new bacterial laccase from a marine microbial metagenome in south China. Further studies based on in silico strategies found numerous new laccases in soil samples.34 Therefore, our study shows that soils under the NT management may represent a hotspot of laccases-coding genes to be prospected. Cellulases comprise several enzymes with the ability to hydrolyze cellulose, with a variety of biotechnological applications, such as the production of second-generation ethanol from cellulosic materials, in paper and textile industries, and food processing.35,36 In our study, cellulases were the third most abundant hydrolases. Based on the KEGG database, we found 7702 cellulase sequences, 3145 in the NTR, 3389 in the NTS, 553 in the CTR, and 615 in the CTS systems (Fig. 1). The NCBI-NR database revealed 8204 cellulases, 3250 in the NTR, 3505 in the NTS, 700 in the CTR, and 749 in the CTS systems (Fig. 2). 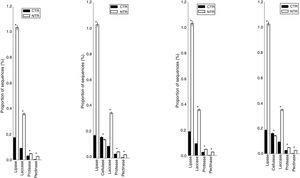 The majority of the sequences were assigned to the Aspergillus genus (4175 sequences) (Fig. 3), Ascomycota phylum. Fungi such as Aspergillus niger, Penicillium sp. and Fusarium oxysporum are reported as important cellulases producers.35–37 In our study, once more, the statistical difference was attributed to the soil management (NT×CT) (Fig. 4). Soils under the NT system are considered more suppressive to pathogens than the CT, and we may hypothesize that the higher abundance of cellulases in the NT may help in the control of pests and diseases. Indeed, the ability of some microorganisms to control pathogens has often been associated with their ability to produce cellulases, for example, the purified enzymes of Trichoderma harzianum were able to inhibit conidial germination and germ tube elongation of the surviving spores.38 In addition, cellulases are also important in the C biogeochemical cycle, where cellulose represents an important source of energy and C for soil microorganisms. Proteases are enzymes that catalyze the hydrolysis of proteins and are critical for microbial performance in all environments; in our study, DNA sequences coding for proteases were the fourth most abundant. The comparison with the KEGG and NCBI-NR databases identified 1567 and 1604 sequences, respectively. In the KEGG database, 459 sequences were found in the NTR, 510 sequences in the NTS, 318 in the CTR, and 280 in the CTS systems (Fig. 1). In the NCBI-NR database, 462 sequences were assigned to the NTR, 518 to the NTS, 330 to the CTR, and 294 to the CTS systems (Fig. 2). Once more, statistically higher frequency of proteases was found in the NT treatment, especially the NTS, while the lowest was detected in the CTS (Fig. 4). Crop residues represent the main source of nutrients for microbes, and most proteins in soils are of microbial origin, being important constituents of the soil N pools.39 It has been reported that higher availability of N and C—as usually found in the NT system10–12—implies in higher microbial proteolytic activity,40 and we may hypothesize that favoring the slow decomposition of crop residues, and increasing the N availability, the protein content would be higher, selecting proteolytic microorganisms, as indicated in our study. On the other hand, the CT speeds up the decomposition rate and losses of soil N pools, and consequently fewer organisms specialized in proteolysis remain. However, proteolytic activities are found even in soils containing very low pools of protein N, as reported for a Bacillus from a desert soil in India,41 and confirmed in our study in the treatment poorest on C and N, the CTS. In our study, amylases were the fifth most abundant hydrolases among the metagenomes. The search in the KEGG database identified 1235 sequences, 303 in the NTS, 276 in the NTR, 336 in the CTR, and 320 in the CTS systems (Fig. 1). In the NCBI-NR database, we found 1247 amylase-coding sequences, 309 in the NTS, 278 sequences in the NTR, 339 in the CTR, and 321 in the CTS systems (Fig. 2). There were no statistical differences between the treatments concerning the frequencies of DNA sequences coding for amylases. 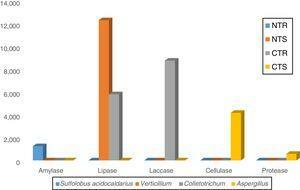 The amylases were mainly related to Sulfolobus acidocaldarius, belonging to the Archaea domain (1247 sequences) (Fig. 3), which in our previous taxonomy study revealed to be most abundant in soils under the NT system.5 The production of amylases by Archaea has been reported in different environments,47,52 but is not as common as for Bacteria such as Bacillus. Therefore, the abundance of DNA sequences from Archaea coding for amylases in our study deserves further investigation, as they may represent novel types. Pectinases-coding DNA sequences had the lowest abundance in our metagenomes. The search in KEGG database identified 532 sequences, 241 in the NTR, 251 in the NTS, 20 in the CTR, and 20 in the CTS systems (Fig. 1). In the NCBI-NR database, we found 627 sequences, 266 in the NTR, 283 in the NTS, 43 in the CTR, and 35 in the CTS system (Fig. 2). We were not able to attribute the sequences to any specific micro-organism. However, the pectinolytic activity is common in several microorganisms, and Aspergillus has been frequently used for the commercial production.56,57 Agricultural soils usually receive pectin-rich crop residues,58 and the higher abundance of pectinases in the NT can be associated with the deposition of residues on the soil surface, favoring the microbial activity4,5,10–12 and diversity.4,5 The statistically higher frequency of DNA sequences coding for pectinase in the NT system (Fig. 4) could be explained by the higher content of soil organic matter. This hypothesis is supported by the study of Nisha and Kalaiselvi,59 who tested the pectinase activity with different sources of C and N, and verified that the synthesis was maximized at higher concentrations of C and N.
Metagenomics has been used to find new pectinases. For example, Sathya et al.60 found nine clones with pectinase activity from a forest soil of Southern Western Ghats, India, and Singh et al.61 found a thermo-stable pectinase in another Indian soil. Even though with relatively few sequences compared with the other hydrolases, the greater abundance of sequences coding for pectinases in the NT highlights the potential of finding new hydrolases of industrial importance in soils under conservative managements. Interestingly, microbial taxonomic5 and functional8 diversities in the same soil and treatments are in agreement with the results that we now report of abundance of hydrolases. Increases in fungal biomass in NT in comparison with the CT have been reported,63 as well as differences in the strategies of C utilization,64 and, in general, in our study, hydrolases sequences were attributed to fungi, Verticillium and Colletotrichum (lipases and laccases), and Aspergillus (proteases). Interestingly, for the amylases, sequences were attributed mainly to the archaea S. acidocaldarius; important roles of mesophilic and thermophilic Group I archaea in soil, more specifically in N-cycling (ammonia oxidizers) have been recently described,65 and now we extend their importance to the amylases. Previously, we demonstrated that fungi and archaea were benefited by the NT when compared to the CT system,5 and now we confirmed that these microorganisms are the main sources of hydrolases under NT. Finally, our results indicate that agricultural soils under conservative managements such as the NT may represent a hotspot for bioprospection of hydrolases for biotechnological and industrial applications. Further studies should now be conducted to try to characterize some hydrolases identified in our study. All data and materials cited on the manuscript are freely available for the scientific community. Metagenome data are deposited at the NCBI-SRA with the Accession Number SRA050780. Financed by CNPq-Universal (400468/2016-6), INCT-Plant-Growth Promoting Microorganisms for Agricultural Sustainability and Environmental Responsibility (CNPq 465133/2014-2 – Fundação Araucária-CAPES) and Embrapa (02.14.01.026.00.06.002). MH and RCS initiated and designed the study. MH and ATRV contributed with reagents/materials. RCS and MEC performed the experiments. RCS and MEC analyzed the data. RCS and MH wrote the paper. All authors read, contributed and approved the final manuscript. Authors declare no conflicts of interest or ethical problems. RCS acknowledges a postdoctoral fellowship from CNPq. Financed by CNPq-Universal (400468/2016-6), INCT-Plant-Growth Promoting Microorganisms for Agricultural Sustainability and Environmental Responsibility (CNPq 465133/2014-4, Fundação Araucária-STI, CAPES), and Embrapa (02.14.01.026.00.06.002). MAN, ATRV and MH are also CNPq research fellows. Shifts in taxonomic and functional microbial diversity with agriculture: how fragile is the Brazilian Cerrado?